Malawi’s commercial city, Blantyre Mayor Noel Chalamanda will next week Wednesday, October 21, 2015 host Corporates to a special event dubbed “The Miss Blantyre Corporate Night” at Ryalls Hotel. The event has been a unique arrangement made by Blantyre City Council in readiness for the Miss Blantyre Beauty Pageant that will take place on October 30, 2015 at College of Medicine. “As a Council, we believe youth should never be leaders of tomorrow, rather of today and be supported in areas of their strength and enterprise,” said Anthony Kasunda, the Council’s Public Relations Manager. “Fashion and pageants are something which excites a lot of young people and it is almost every girl’s dream to be a queen. Whoever wins will take up social and community roles to lead fellow youth into responsible and active citizenry” he said. Kasunda further said as part of the grand prize to the winner, this year’s Miss Blantyre will during her tenure of office, be an ambassador for the Keep Blantyre City Clean and Green Initiative. Chalamanda to be at the event. This campaign has been Blantyre’s popular investment as the city is empowering residents to practice health and sanitation measures for the health of their lives and the beauty of the City. He mentioned rehabilitation of roundabouts and other sites in the City as some of the activities the Council is implementing in partnership with corporate residents. Through the current Miss Blantyre Nerani Nthara, the city also targets primary schools as one area where kids should be taught with more emphasis to keep their schools clean as such behavior goes even at home and nurtures responsible citizens. 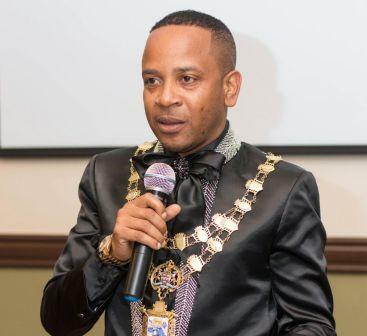 During the Corporate night, the Mayor will present his vision for Blantyre youth and also interact with fellow decision makers over a cocktail which has been sponsored by BizMalawi. On their support for Miss Blantyre, BizMalawi’s Managing Director Tarang Makhecha said they recognize the importance of supporting youth activities as part of development. He said Blantyre City Council, as a government arm, can only thrive if there is a good working relationship with the corporate community. Preparations for Miss Blantyre 2015 are at a very advanced stage and 15 ladies have so far made the final list. Chairperson for the Miss Blantyre Pageant Daniel Ngwira is confidently promising the public a phenomenal night which will have not just the parades by the ladies but also an innovation called brand exhibition as a category. In this concept, contestants will be challenged to model and represent a business, company or organisation and that when the public will see them, they should be able to see the institution. Outgoing Miss Blantyre Nerani Nthara has called on successful women in the country to support Miss Blantyre activities as most girls look up to them as role models. “I look forward to a day when these great women can speak their stories to us,” said Nthara. The last Miss Blantyre was conducted on 6th December 2013 and last year was silent due to sponsorship problems. This year, Blantyre City Council has empowered the event and still lobbies for sponsorship as it attracts heavy expenditure lines to live up to its billing. Do we have mayors in Zomba, Lilongwe and Mzuzu? All we hear about is Noel Chalamanda, who I must say is doing a great job, as mfumu ya mzinda wa Blantyre. Keep it up Noel. I like this man he is the best of all the mayors. I hope he is not stopping here but going all the way to the presidency I will vote for him. Look at how BT has changed.